Feel like a person, not a number. Our firm has been assisting accident and injury victims for over 30 years. Proven track record of results. Find out other great reasons to hire Mullen & Mullen. Why should you hire Mullen & Mullen’s personal injury lawyers instead of other firms? Some personal injury firms run an assembly line. They advertise constantly on television and radio and cattle farm tons of clients through a pre-determined process. You feel like a number…a cog in the machine. At Mullen & Mullen, we treat you like family, handling your case like we were representing ourselves. We focus on helping you recover physically and emotionally from your injuries. We help you deal with the stress the event has placed on you and your loved ones. Carefully listen to the physical emotional impact your accident has made on your life. Connect you with medical service providers who delay billing until your case settles. Help you get an immediate loan, if you need it to make ends meet for a while. Don’t employ paralegals. You always talk to your lawyer when you need answers. Are family owned and operated. Shane Mullen, and his father Regis, work together to fight to win you the money you deserve. Regis Mullen – our firm’s founder – has more than 40 years of legal experience. Originally, he worked for insurance companies, including as a litigation supervisor. He passed on the tricks insurance companies use to delay and deny claims to firm attorneys Shane Mullen and Joseph Morrison. His son, Shane Mullen, has shown great skill in the beginning of his career. In fact, Super Lawyers, a Thomson-Reuters publication that ranks the top 2.5% of lawyers in each state, has named him a “Rising Star” for 2014-2016. That means he’s one of the best you can get with less than 10 years of experience, or under the age of 40. He’s also a member of the Million Dollar Advocates Forum, which means he’s won cases with values in excess of $1 million. Joseph R. Morrison, Senior Associate Attorney, oversaw hundreds of cases at the firm he originally founded – McKey, Morrison, & Sanchez, P.C. He also won the 5th largest premises liability verdict in Texas in 2012. The case was Jeffrey Young vs. ConAgra Foods, Inc.
We employ our own private investigator for you. The majority of firms contract these services out – and pass the costs on to you. Instead, we pass the savings his services allow to you. You get a lower contingent case fee of just 29%, compared to 33.3% most firms charge. We’re confident in our approach because we believe we can you get a higher settlement value at our firm than most others. These savings again pass on to you. 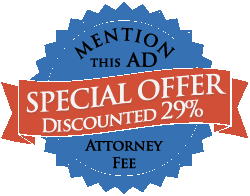 Make sure you mention this website to qualify for the offer (it applies for cases that settle out of court only – and about 90% do). It does not apply to dangerous drug cases. Our unique combination of personal service, vast experience and accolades, and cost savings is evidenced in our numerous 5 Star Reviews from prior clients. Call us today at 314-465-8733 (314-INJURED) for your free consultation, or contact Mullen & Mullen online to learn about the compensation you may be entitled to. Remember this is just a friendly conversation to see how we can help you. There’s absolutely no pressure to hire us on the spot.